I love Portland a heck of a lot. As such, I try really hard to be a good Portlander. Using some highly scientific analysis (counting the number of tattooed folk in the wait line outside Pine State Biscuits on a Saturday morning) I have determined that Portland has the highest ratio of tattooed people per capita. And since I have not gotten a bona fide tattoo in nearly 17 years, I figured I was GREATLY overdue. So I called up my pal @camikaos, who is something of an expert on the local tattoo talent, for an artist recommendation. She sent me to Jesse at BlackBird Tattoo on Killingsworth. Now, I’m not one to get just any tattoo. My tattoos must have meaning. Notice how I bolded that. Because it’s important. So after much deliberation, I got a sun on one arm and a moon on the other. The sun goes on the right arm, the positive side, the action side. The moon goes on the left, the negative side, the side of restraint. These are somewhat Kabbalistic attributes. 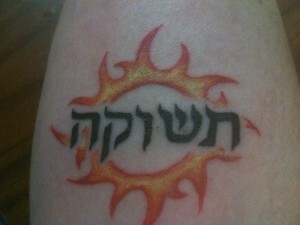 Therefore, the words, in Hebrew, the language of Kabbalah: tshuka, passion, on the sun. Izun, balance, on the moon. Two of the most important things to have in your life. Without passion, life is empty. Without balance, life is chaos. 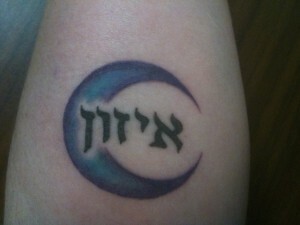 This entry was posted in Personal, Portland and tagged hebrew 101, i love portland, kabbalah, tattoo by Morgan. Bookmark the permalink. Very nice! Can’t wait to see in person.